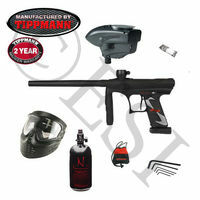 New Tippmann Crossover Paintball Gun - Available Now! Tippmann has finally brought forth what so many have been asking for all these years, a simplified lightweight marker with all the reliability of the Tippmann brand and all the features of their previous models in one well-rounded package. The Tippmann Crossover is brimming with features including integrated break beam anti-chop eyes, low pressure operation under 300 PSI, integrated grip through gasline with the option to convert to a front regulator, magnetic Hall-Effect trigger switch, multiple adjustable firing modes, including semi-auto, auto-response, 3-shot burst, PSP, NPPL and Millennium, adjustable clamping feedneck with vertical feed, and A-5/X-7 threads. Although the most exciting feature for players is the Tippmann patented FlexValve technology integrated from the Phenom and now present in the Crossover. The ability to run from electronic to mechanical operation in the middle of a game will be a fantastic feature with the added benefits of the low recoil, low pressure features of the FlexValve. The Crossover is sure to take the game to new heights and new possibilities, don't be the last to take advantage of this amazing marker. 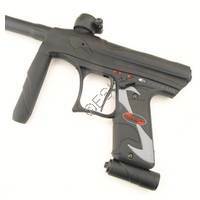 All of our Tippmann Paintball guns include FREE UPS Ground shipping. A look at the Tippmann Crossover XVR. What's In The Box? It will be available in Red, Titanium, and Olive and begin shipping from Tippmann on 10/15/2013. The Crossover XVR comes in a nice padded canvas case with zipper closure. The gun straps securely in to the case with velcro straps. A two piece, two tone barrel is included also. Accessory kit includes a grease packet, all the tools you need for any screws in the gun, a barrel sleeve, squeegee, and a volume chamber spacer. New to the XVR is an included barrel adapter that lets you use any Autococker threaded barrel on the gun. Some new features compared to the standard Crossover would be the new venting ASA. Attach your tank by screwing it in normally. Then you can turn your tank off using the knob on the ASA. When you turn the tank off the knob will vent off the back pressure so you can easily take off your tank. The XVR also has tooless access to the spool valve. By pushing in the button at the back you can pull back the rear grip knob. Then holding on to that knob you can unscrew the valve for complete access to the internals. The grip cover is held on by speed locks so you can quickly access the battery compartment. A new lightweight aluminum trigger is also included.